We’ve had a busy few days. Some ups and some downs like always. Overall we’re still making progress though. Here’s my favorite picture from the past week. Holding sweet baby James! Mason got some really good news yesterday. His head ultrasound showed improvement again! Yay! Like I said last week, head ultrasound day is my least favorite day every week. Of course it’s Monday. This week, though, we got great news. Mason’s ventricles are getting smaller still and they think there is no bleeding outside the ventricles. We had to wait all day though. I missed Dr. Miquel’s call but she left me the best voicemail I could have hoped for. I would have given her a hug if she told me this news in person! Otherwise Mason is about the same as last week. He’s being treated for a fungal infection so they can’t do much else right now. Good news on the infection is that he’s not acting sick and they identified it as a common form of yeast that responds well to the meds he is already getting. Once he finishes this treatment and we confirm that he no longer has a fungal infection, he will get the steroid to help his lungs get stronger. Don’t tell Mason but he’s actually doing pretty well with his breathing. 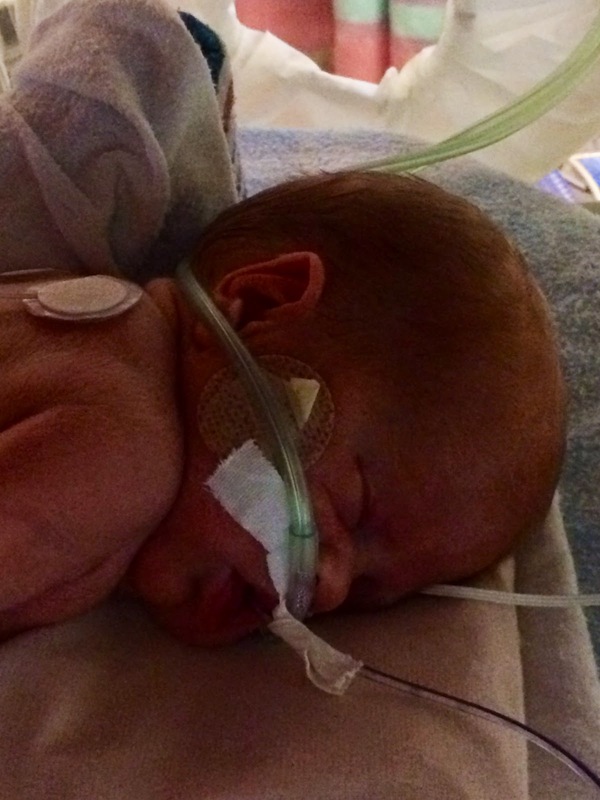 He’s still on the jet ventilator but they have been able to wean his settings so he’s getting less support. Here’s a picture of Mason from today. He’s puffy (not fat). And he’s wearing a giant diaper (he graduated from micro preemie to preemie size). The puffiness should go down as his lungs get better and he gets off some of his meds. Logan had a rough weekend. And that’s an understatement. 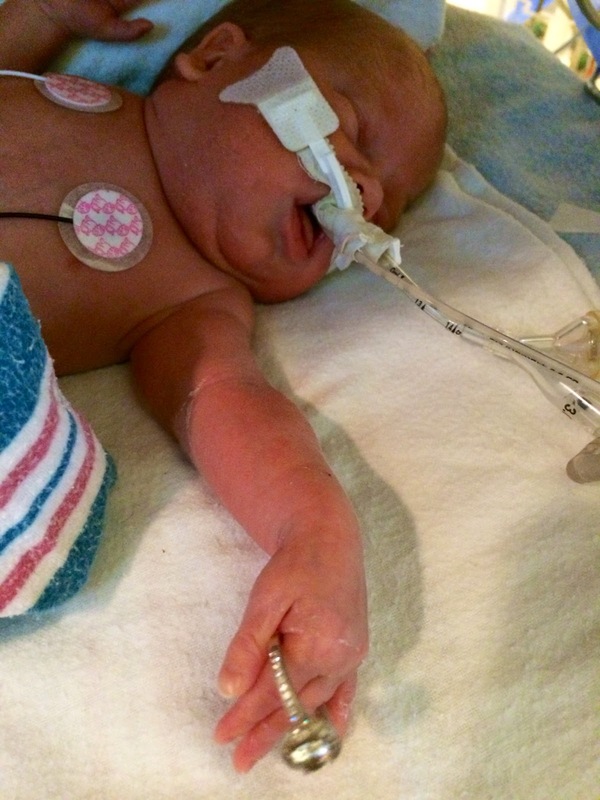 Last Thursday he got off the jet ventilator and back on the regular ventilator. This turned out to be too good to be true. 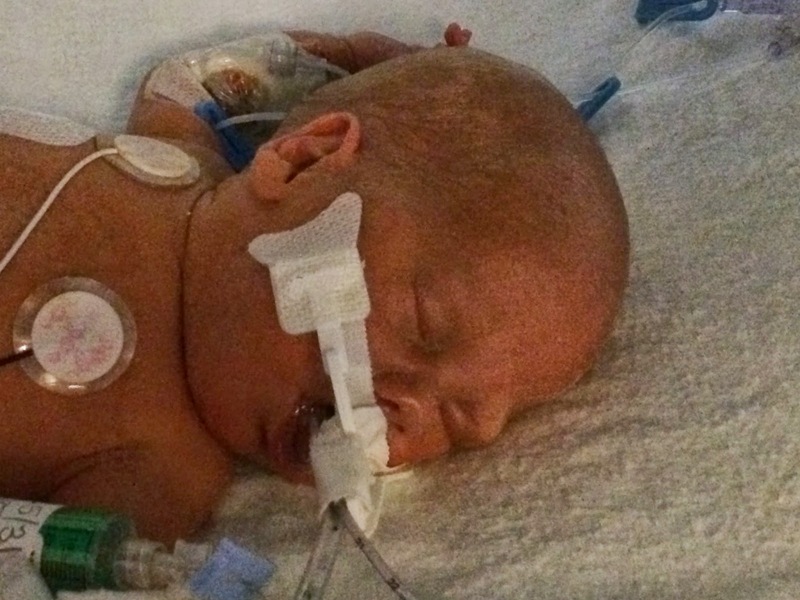 On Friday he needed a new breathing tube and things went all kinds of wrong for him. Poor guy. He got a pneumothorax, which is an air leak in the lung. This has been a risk all along because we know he has sick lungs and he’s had PIE in the past, which is related. So Logan had to get a chest tube Friday to get the air out of his chest cavity. He recovered really well and actually went down to pretty low ventilator settings. Then on Saturday morning his chest x-ray showed that the PIE was back. So Logan is now back on the jet ventilator. He still has the PIE but he seems pretty comfortable. And he’s on pretty low ventilator settings still. Today they were able to turn the suction off on the chest tube too because they don’t see a leak in his lung anymore. So we’re making progress. Logan is getting the steroid for his lungs right now. He’s on day 5 of 9. We haven’t seen much improvement other than a lower oxygen requirement. Hopefully the PIE will go away in the next few days and his lungs will start to improve. To make matters worse, Logan’s nurse this weekend picked out the most horrible blanket to cover his isolette – Nascar (sorry Nascar fans). I came to the rescue yesterday. The one he has now is much better (but still has creepy clowns on one side). Dr. Peeples is working on this for us. We’ll see if she comes through. Apparently she has a thing against ugly blankets. I’m glad we’re on the same page. Here’s a few pictures of Logan from this week. He’s laying on his side to hopefully collapse the right lung somewhat, which will help get rid of the PIE. And he’s a little jaundiced but he’s getting meds for that too. These next 2 are from Saturday right after he got the chest tube put in. James had a great weekend. He is taking the steroid for his lungs and it’s working! 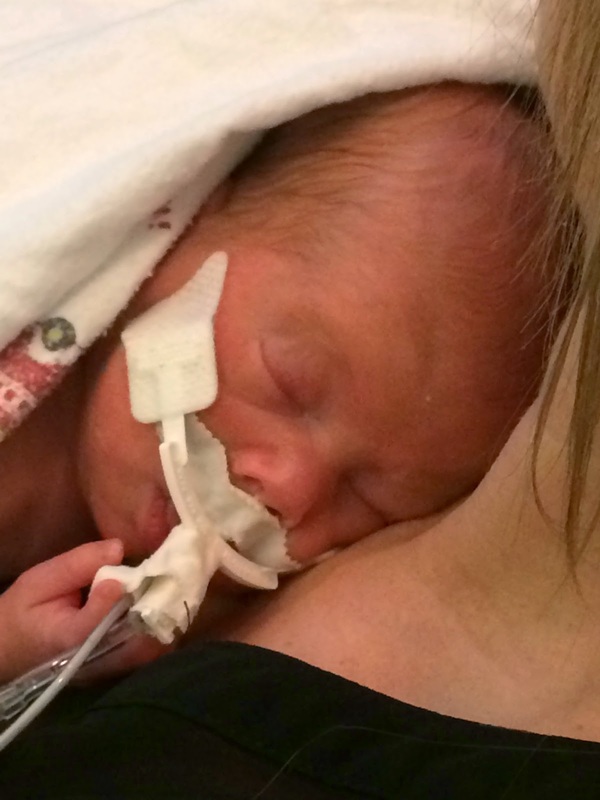 James got off the ventilator yesterday and is now back on the nasal cannula. Poor kid doesn’t like the nasal cannula in his nose though! When they first put it in he kept sneezing! 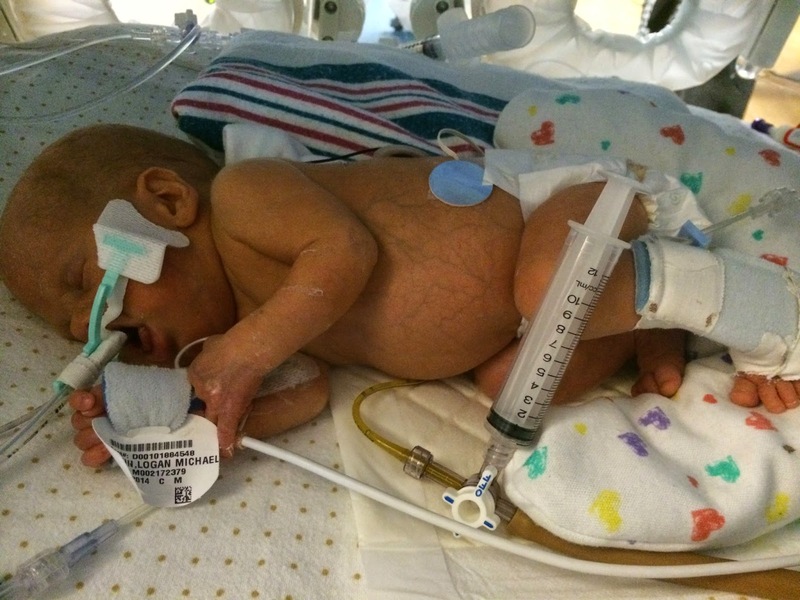 And although he can cry now that he doesn’t have a breathing tube in between his vocal cords, he is so hoarse that not much noise comes out! I bet that’s frustrating! So far James is doing great off the ventilator. In fact, he’s doing so well that Dr. Miquel called him her boyfriend (and babies have to be really good to make boyfriend status). Hopefully he can stay off this time (and keep his older woman girlfriend too)! I’ve said this before, but James is super feisty and he has an attitude! I convinced Dr. Miquel that he got this from Brian. She doesn’t know me very well obviously. James also had another big milestone today – he got to wear clothes! He is big enough and he is keeping his temperature up well enough on his own that he can wear clothes now! So today he got to wear a little t-shirt (it was huge on him) and he got to be swaddled for the first time. I think he liked it! They said I can bring clothes to the hospital for him but I don’t have anything small enough! He only weighs like 3 1/2 pounds! Here are a few more pictures of James from this week. I do not have giant hands I promise! 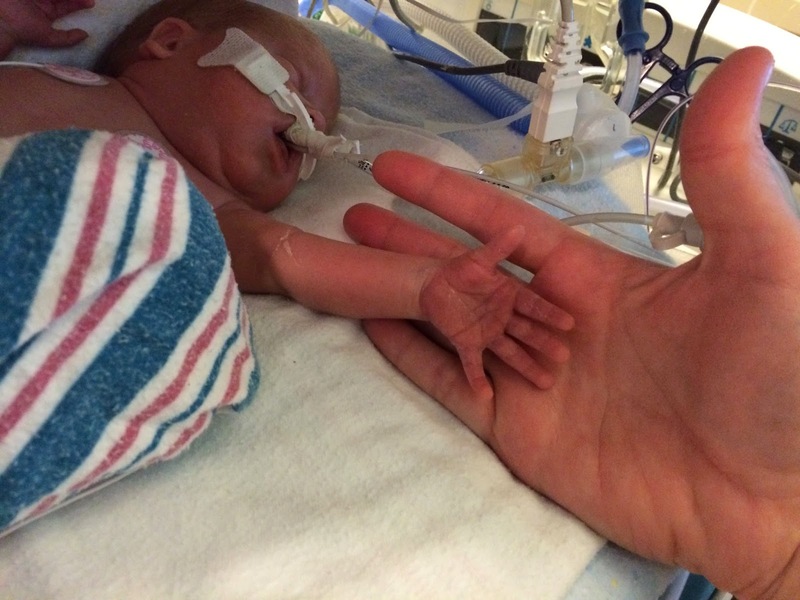 His hands are just super tiny! I put my ring on him for just a second. Not too long though because he likes to fling his arms around! I have had a lot going on the last few days too. As you may know, I have been struggling with breast pumping. Well the 3 things that help with breast milk are (1) a baby breast feeding; (2) low stress; and (3) supplements or medication. Obviously I don’t have (1) or (2). So yesterday I started taking fenugreek. And now I smell like maple syrup (just a little). And my burps taste like maple syrup too. As much as I like syrup (it is one of the four food groups after all), hopefully I’ll see an increase in milk soon too! I went to see Dr. Dora today for my final checkup and everything is great. I was kind of excited to see how much weight I have lost so far too. So far I can wear 1 pair of shorts and 1 pair of jeans. This is pretty exciting news! Unfortunately the 1 pair of jeans are my least favorite pair of jeans (and I have a lot of jeans). Well, I got on the scale and . . . I weigh exactly the same as I did a month ago! What?! Seriously. If my mom and my grandparents didn’t read this I would say WTF. (sorry Mom and anyone else I offended). So I asked Dr. Dora if I can start running again and she said yes! Yay! Hopefully this will help with my stress level too. We’ll see. I went for my first run tonight. It felt great. Let me clarify that a little. It felt great to be running again, to sweat, and to do something I enjoy that is good for me. The actual act of running did NOT feel great. And I did Week 1 Day 1 of Couch to 5k so I only ran 8 minutes out of the 20 I ran total (1 minute running, 1.5 minutes walking, repeat). Regardless, I’m glad I did it. And I have a long way to go before I can run like I did before I got pregnant! I’m sure once the babies come home I’ll get way off track and have to start over again in the future. But for now it feels good to be able to do something for myself. 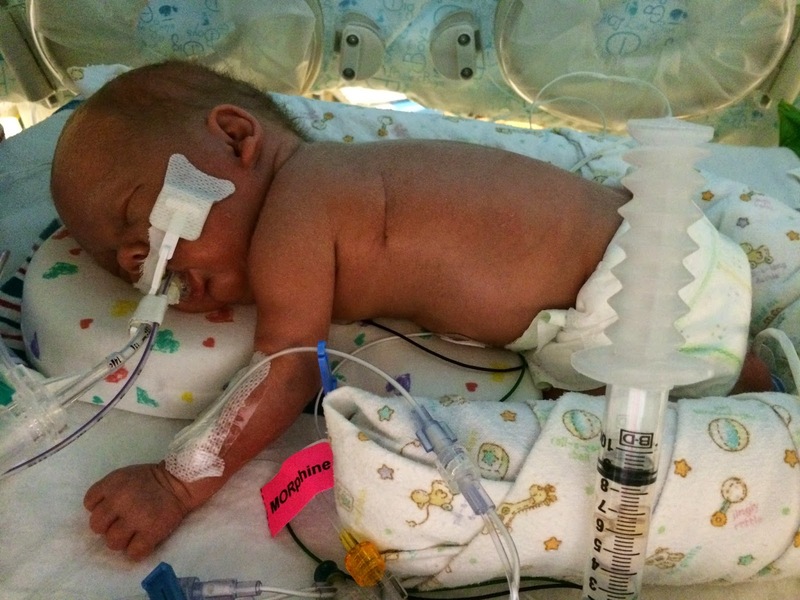 This entry was posted in #goals, exercise, NICU, Triplet Milestones by Angela Mann. Bookmark the permalink. So happy to hear everyone is doing well! 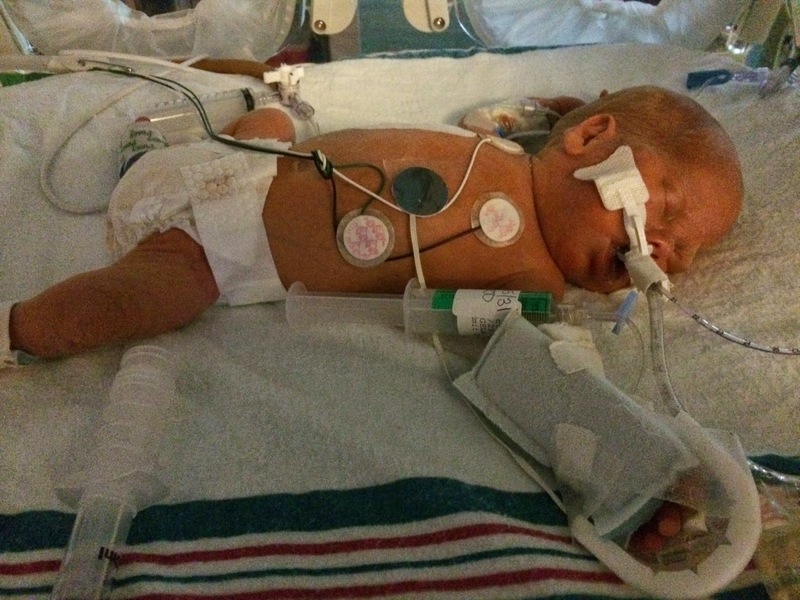 Walmart usually has preemie sleepers that fit up to 5lbs. They no longer fit my boys once they hit the 5lb mark though. I also pumped right after I held a baby, holding them always helped bring in more milk for me. Kellan was always trying to suckle too so maybe that helped even though he wasn't big or strong enough to actually nurse.